Be the first to share your favorite memory, photo or story of Grady. This memorial page is dedicated for family, friends and future generations to celebrate the life of their loved one. 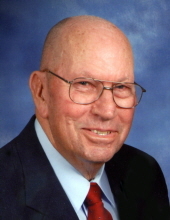 Funeral services for Grady Glenn Newman, 82, of Bethune, will be held at 3:00 o’clock p.m., Sunday, January 27, 2019, in the sanctuary of Mt. Pisgah Baptist Church, Jefferson. Rev. Terry Corder will officiate. Burial will follow the service in the church cemetery. Chaplain Jenny Clamon will conduct the committal rites. Mr. Newman died, Wednesday, January 23, at his home. Born in Bethune, he was a son of the late William Charlie Newman and Nannie McCaskill Newman. He retired from Kershaw County School District as a maintenance supervisor. Mr. Newman was a faithful member of Mt. Pisgah Baptist Church, where he served as a deacon and Sunday school teacher. He was very active in his community. He was a member of Bethune Lion’s Club, Woodman of the World, Lodge # 757 and Lynchwood Lodge # 197 AFM. Mr. Newman served on the Kershaw County Election Commission, Kershaw County Red Cross Board of Directors and Bethune Town Council. He was most proud of the time he spent serving his country in the United States Navy from 1956-1960. Prior to serving in the Navy he had served in the National Guard. Surviving are his wife, Myrtis Eubanks Newman of the home; 2 daughters, Theresa N. (Robert) Horton of Lugoff, Donna N. (Danny) Gaskins of Bethune; 5 grandchildren, Daniel (Laura) Roberts, David (Stephanie) Roberts, Josh Roberts, Andrea Gaskins (D.J.) Starling and Will (Katherine) Gaskins; 7 great grandchildren; 2 sisters, Helen (Glen R.) Catoe and Elaine Hartis; 3 brothers, James D. Newman, Nelson (Linda) Newman and William C. “Bill” (Cora Lee) Newman and a sister-in-law, Barbara Newman. Also surviving are special friends, Tena and Mary Johnson and many nieces, nephews and in-laws who loved him dearly. In addition to his parents, he was preceded in death by his son, Gerald Glenn Newman and siblings, Sara Lee Anderson, Cecil Gerald “Buster” Newman, Roy Dale Newman, Boyd Newman, Heyward Newman, Alma Hilton and Susie Mae McGee. The family will receive friends, Saturday, January 26, from 3:00 to 5:00 o’clock p.m. at Baker Funeral Home and other times at the home. Memorial contributions may be made to Mt. Pisgah Baptist Church, Building Fund, 2140 McBee Highway, Jefferson, S.C. 29178. The family would like to thank KershawHealth Hospice and Mr. Newman’s other wonderful caregivers for the love and compassion shown to him and the family. Baker Funeral Home, Kershaw is serving the Newman family. To plant a tree in memory of Grady G. Newman, please visit our Tribute Store. "Email Address" would like to share the life celebration of Grady G. Newman. Click on the "link" to go to share a favorite memory or leave a condolence message for the family.